Billy Koch of Little Red Feather Racing invited Matthew Espinosa and company down to the winner’s circle if the Little Red Feather horse won. Alas, it was Koch’s horse was nipped at the wire. Koch mentioned there are ways of having fun as an owner in a partnership. Asked about that later, Espinosa didn’t rule it out in the future when he’ll have more time for hobbies. Horse racing will have to wait until Espinosa returns from his upcoming Going Global Tour, where he’ll be appearing in 22 European cities from August 4 to 31. 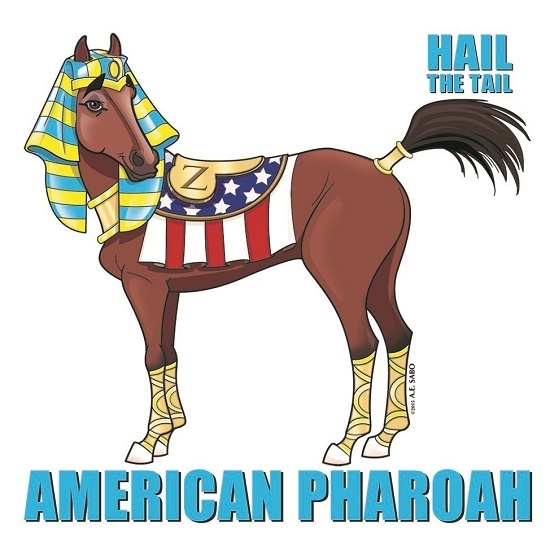 Image courtesy of America’s Best RacingEn route to running in the Haskell Invitational at Monmouth Park, American Pharoah’s flight from California will touch down at Atlantic City International Airport Wednesday afternoon. The Haskell Invitational, August 2, is American Pharoah’s first start since clinching the Triple Crown when he dominated the Belmont Stakes in early June. Ending a Triple Crown drought of 37 years, American Pharoah joined Secretariat, Affirmed and Seattle Slew as one of only 12 Triple Crown winners going back to 1919. The Haskell is part of the win-and-you’re-in Breeders’ Cup Challenge series for the Breeders’ Cup Classic and it will be broadcast live on NBC from 5-6 p.m. The public is welcome to watch American Pharoah on his morning gallops before the Haskell. The Monmouth Park Racetrack Clubhouse will be open to fans Friday and Saturday mornings between 7 a.m. and 8 a.m. where they will be able to see American Pharoah and fellow Haskell entrants exercise. Three years ago, a McKinsey & Co. report, “Driving Sustainable Growth for Thoroughbred Racing and Breeding”, gave thoroughbred racing a wake-up call: If the Jockey Club and its kin didn’t address the main issues facing racing, the sport would decline, becoming marginalized and moribund. reinvest in new fans through simplified betting, social games, and promoting innovations in on-track experiences and new-look OTBs. The kid gloves are off. The foundation of racing integrity reforms, a national, uniform policy covering the used of race day and pre-race medications and treatments, is still not in place. At the 2013 Jockey Club Round Table, Chairman Ogden Mills Phipps raised the spector of the Jockey Club supporting federal intervention and regulation if “the current medication reform effort stalls.” With the 2014 Round Table taking place this weekend on August 10, it’s hard to deny the coincidence that a consortium of 24 leading thoroughbred trainers releasing a statement outlining a timetable to eliminate race-day medications on August 1. Time will tell if this is last minute pandering or a genuine commitment to reform. It’s yet to be seen whether or not this will satisfy the Jockey Club. Despite the trainers’ statement, there is much divisiveness over drugging racehorses. It would be nice if the issue could be resolved within the comfortable confines of the Round Table. Given the polarity of opinions on uniform medication, it’s more likely that acceptance will be gained through a state-by-state, racetrack-by-racetrack, or even barn-by-barn dog-fight. That is, unless the feds step in with a medication policy, mandate regulation and oversee its implementation. Casting aside its institutional cobwebs, the Jockey Club launched America’s Best Racing (ABR), “a multi-media new-fan development and racing awareness-building platform.” ABR’s goal is to increase the profile and visibility of North America’s best Thoroughbred racing events, focusing on the sport’s lifestyle and competition aspects. A squad of ABR social media mavens and outreach ambassadors has infiltrated the millennial ecosystem across the nation. Bloggers, videographers and photographers report major races and events. Racing news drives ABR’s website, accompanied by track etiquette, racing and wagering tutorials, and what-to-wear — from haute to affordable. Indeed, racing’s fashion cadre includes leading young turf writers, bloodstock agents, jockeys and racetrack professionals as well as casual race-goers. Instead of only visiting tracks for a week leading up to their biggest race we’re able to be in a market year-round and continue to cultivate and maintain — which is extremely important . My NE colleague Dan and I are able to host guests at the track when timing suits their schedule best and help create the ultimate first-time experience at the races. When I’m not hosting guests at the races I spend the majority of my time researching the top influencers, young professional groups and the movers and shakers in the market – once I’ve identified those people I reach out about who I am and what ABR is and then once they respond we begin coordinating their trip to the track. If it’s food bloggers I might suggest they come out to a day of food trucks at the races, a fashion blogger on a day when there’s a hat contest, etc., showing people how horse racing can fit into their lives. A good number of our guests have been bloggers – lifestyle, travel & fashion bloggers are eager to try new things and tend to share those positive experiences with their followers, which in turn, gets more people interested and aware of horseracing. Everybody knows somebody, so if every person we brought out to the races influences or brings just one friend (who brought another friend etc.) it naturally grows our wonderful sport. There is a bar in town that has been great to us — it’s literally called “Derby.” Derby is outfitted with authentic retro horse racing decor, which makes for a great venue to work with. Add to the fact that it is located in a fairly young, hip part of town and it became fairly apparent this is an off-track location that not only identifies with the sport, but also could legitimately develop fans. I’ve held race watch parties, as well as three bus trips to Arlington that have over 50 people in attendance. Nearly all the attendees are eager to learn about the nuances of racing. What I have found is that there is no shortage of “interest,” but there are undoubtedly deficiencies in education and awareness of the sport. My role and goal has always been to create a baseline, yet lasting awareness of the top Thoroughbred racing North America has to offer. In a given day of hosting a group at the races, I want to make sure they leave with the “training wheels off.” I like for them to be able to read the program comfortably, have a solid understanding of the facts and fiction of the sport, and know how to have a blast wagering only $20 throughout the course of the day. Last but not least, I hope by the end of the races, they are already planning their next visit. Televised programming finding its way. Another component of McKinsey’s recommendations is television coverage. Network television is paying more attention to horse racing. NBC, NBCSports and Fox Sports 1 are covering major races from coast to coast. The Breeders’ Cup Challenge Series has teamed up with NBC and NBCSports to broadcast hotly-contested races that qualify the winners to a guaranteed Breeders’ Cup berth, waived entry fees and travel money. The series showcases the best in racing between spring’s Triple Crown madness and the Breeders’ Cup Championships in late fall. Jockey Club Racing Tour on Fox Sports 1 offers an eclectic mix of top races from the U.S., Canada and Dubai. NBCSports and Fox Sports 1 are cable-only viewing; availability depends on the cable provider and package subscribed to. The challenge with relying on traditional television is the changing habits in viewing media. Tablets, smartphones, and laptops are ubiquitous. They offer the possibility of watching races while untethered from a television. Livestreaming to these devices is available for some racing, not all – which is frustrating. Considering that the millennial generation, being wooed by racing (and every other sport…) is as comfortable using a smartphone as a television remote, it makes sense to have livestreamed racing as part of a racing media package with the networks. To educate prospective owners and provide current owners with at-their-fingertip information needed to make informed decisions about their horses, OwnerView is a first class resource. Finding success in social media horseracing games has been elusive for the Jockey Club. Future in-house game development has been abandoned. The 2014 Jockey Club Round Table will be livestreamed starting at 10 a.m. on Sunday, August 10.